This project was undertaken directly between Hewlett Packard, ISS and Wirefield. HP target ISS to offer energy management solutions and innovation in conjunction with energy savings and an overall view of product life cycle. 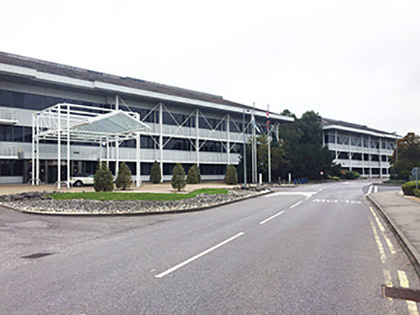 The headquarters at Bracknell was being reviewed as a proof of concept for roll out to other locations throughout the UK. ISS and Wirefield have a very close working relationship which provided the opportunity to demonstrate the EYE-WI wireless lighting system and fulfil the key performance criteria. Wirefield met with the ISS Technical Operations Manager to present options and discuss solutions for relighting the UK Headquarters of HP. It was determined that ISS and the client had looked at various proposals but it had not been possible to achieve the strict criteria required by the management team. Namely, one for one replacement (avoiding the need for a rewire of the site), strict energy saving targets and the aesthetics of the product. It was very clear that a traditional LED panel was not what was required and Wirefield would need to develop a bespoke solution for the client. Wirefield presented case studies of other sites which had used LED and T5 solutions along with an indicative proposal for the HP site. T5 was dismissed as it was evident that only the latest innovation would be accepted. Furthermore, this highlighted the need to move away from a traditional LED panel whilst retaining the benefits of LED technology. When LED lighting had been agreed with the site the next stage of the discussion was regarding control. Wirefield presented various dimming options such as 100%-10% individual control, DSI and DALI dimming. However, while this fulfilled the criteria of potential energy savings, a rewire would have been required to control lighting in groups. Therefore, a further meeting was arranged to demonstrate EYE-WI wireless technology. Wirefield demonstrated the ability to link fittings together without a hardwired connection or LCM, control groups as small as 2 fittings and as large as would be required in an open plan office and crucially avoid a rewire of any of the site. In addition, monitoring of emergency lighting and recording of occupancy data helped to prove the system to the site and allowed the specification to move forward. HP Bracknell was using manual switches meaning lighting was left on in prolonged periods of absence. In addition, the manual switches controlled a quarter of the office floor. It was necessary to reduce these groups so that they offered an energy saving but also that the user experience was not affected. Individual sensors would offer a significant energy saving but would have resulted in pools of light rather than small groups. Wirefield completed sample plots of the site and did an initial survey to check spacings and suitability. Luminaire counts were provided by ISS. These drawings would be used by ISS, for commissioning and ultimately by HP. The luminaires were replaced one for one across the site with the sample designs proving the scheme feasibility. The selection of luminaire was carefully considered to minimise client impact. 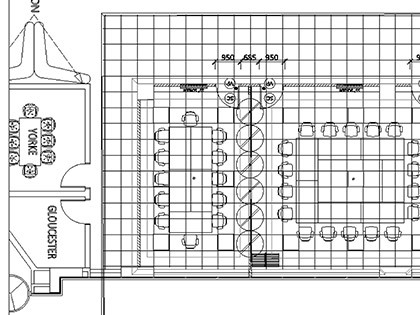 Lighting plots were completed with luminaires at full output. The design process standardised the fitting layout and type for all areas of the site. 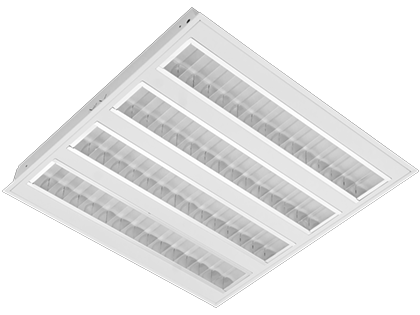 A 40w LED 600x600 luminaire was selected, with 4 split louvres and double diffused LED array. 2x40w PL 600x600 fittings were installed. Louvres were dull and UV damaged. A number of fittings were coming loose from their fixings and there were numerous lamp failures. Ballasts and lamps were failing. Replacing lamps and ballasts was costing the site over £30 in materials alone per fitting. The client had tasked ISS with ambitious energy reduction and site improvement plans. 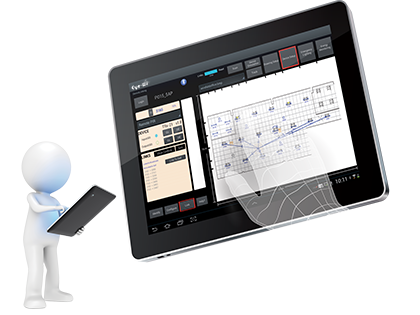 EYE-WI system features allowed the ISS to discuss occupancy in a far more detailed way with their client. 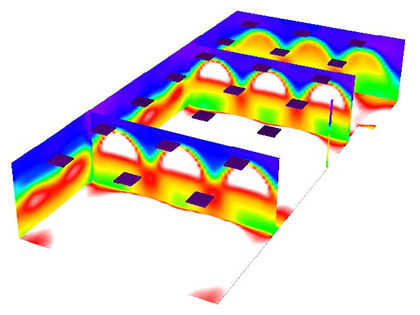 A building utilisation study had identified utilisation at 45%. The system is able to automatically adapt to changing occupied and non-occupied areas and control these areas accordingly maximising efficiency. More than presence detection, the system has intelligence to dim and control lighting depending on the day to day business operation. The site was offered a retrofit solution where existing bodies could be retained. Whilst this was attractive in terms of cost, the age of the fittings was not suitable for this solution. In addition, LED replacement lamps for PL lamps are not of a sufficient quality to be considered for a site wide replacement. Furthermore, LED tubes could not have fulfilled the dimming and integral emergency requirement. The site was offered a fully hardwired DALI solution. DALI could have grouped in large areas with remote sensors, it could not have provided moving groups of luminaires around each sensor so that the light follows you as you walk. In addition, fears of recommissioning in the event of a ballast failure and integration with the existing BMS system meant that the features of EYE-WI continued to present favourably. The site was offered a flat panel as a cost effective solution. ISS and HP required the latest in technology and a bespoke LED solution so this was discounted at an early stage. It is also not possible to integrate sensor control into the flat LED panel. The final Wirefield proposal and solution was offered in the summer of 2015. The installation was completed within the projected timescale and fully commissioned to allow the site to begin realising the energy savings and reduced maintenance promised throughout the process. The flexibility of the wireless system in conjunction with bespoke luminaire diffuser design has allowed floors to be reconfigured since the initial commissioning process. This has involved turning the output of the fittings down during the commissioning process. Luminaires were originally supplied at 85% output and have since been turned down to 70%. 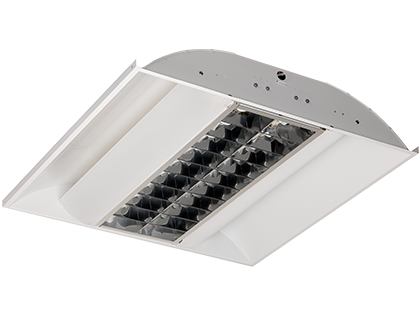 This has increased the achievable energy savings with the added benefit of underrunning the LEDs and driver. This provides the optimum solution achieving the difficult balance of illuminating the office to the required level whilst maximising energy savings. "ISS have worked with Wirefield to develop an energy saving and innovative solution at our high profile HP office locations throughout the UK. Steve Mace Technical Operations Manager.